Witches, weres, and vamps are a good combination. Plenty of arguing and finger pointing going around. Then Robertson decides to add another element to the mix, the fairies have declaired war! 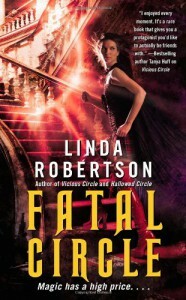 Fatal Circle, book three in the Persephone Alcmedi series steps up the action! Menessos actually did something that appears selfless. Now the fairies are demanding his life, and Seph wont willingly give him up. Loyalty is a good attribute, though it is going to cost her. Johnny continues to be sucked into the politics of the weres. A reluctant leader is what he would be, yet he is on a slippery slope he can’t get off of and that means Seph is left behind. What urban fantasy series is complete without an all out brawl. Bring in everyone, throw in some magical creatures and see who is still standing in the end. High action and tough choices is what you will find in Fatal Circle.